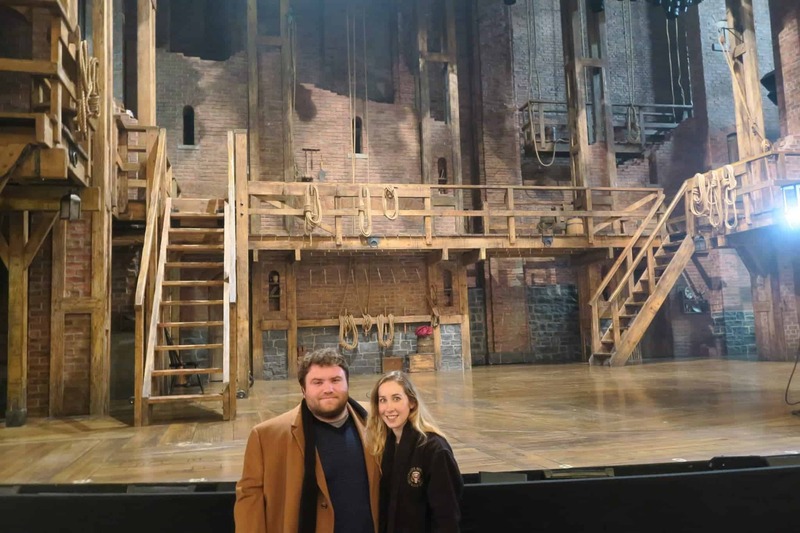 If you are lucky/privileged enough to get Hamilton tickets, you have probably either listened to the soundtrack a million times and know every word, or are wondering if you should get the soundtrack and learn the music. Or, should you go in blind? Gahhh…dilemma! 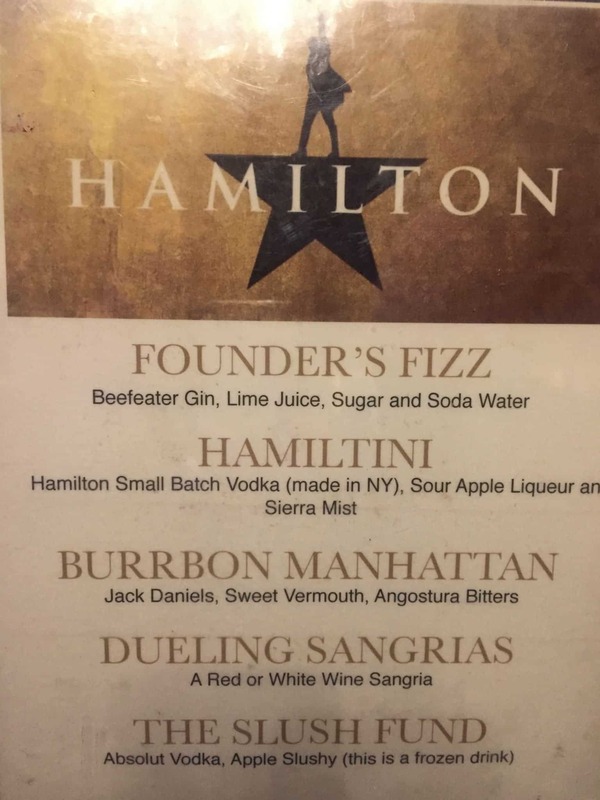 But, Hamilton has (spoiler alert?) minimal spoken dialogue; it is entirely sung-through. Much of the show contains rap music, so those words go by fast. Consequently, to get the most out of your Hamilton experience, I absolutely recommend listening to the soundtrack first. 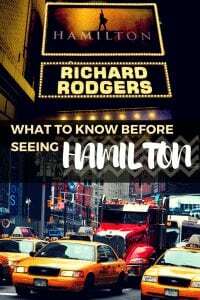 Now that we have that out of the way, let’s get into exactly what to know before seeing Hamilton. How do you get the soundtrack? You can buy the soundtrack on Amazon, iTunes, or listen to it on Spotify and YouTube. You can also buy a physical CD at a local music store like Amoeba music in Los Angeles. The show is music straight through and there are 46 songs on 2 CDs; so, if you are irresponsible like myself, you will have lost the second half of the show almost immediately and know the first half a little too well. Sometimes it pays off to have a 6-year old laptop and a car with an actual CD player because I am able to listen to the soundtrack at all times of the day. When should I listen to the soundtrack? I definitely could have done a better job preparing to see Hamilton. Basically, I waited until the 3 weeks before I went to New York to see Hamilton to listen to the soundtrack nonstop. This is absolutely the WRONG thing to do. In fact, I think the Hamilton soundtrack should be completely off limits for the entire month prior to your trip. 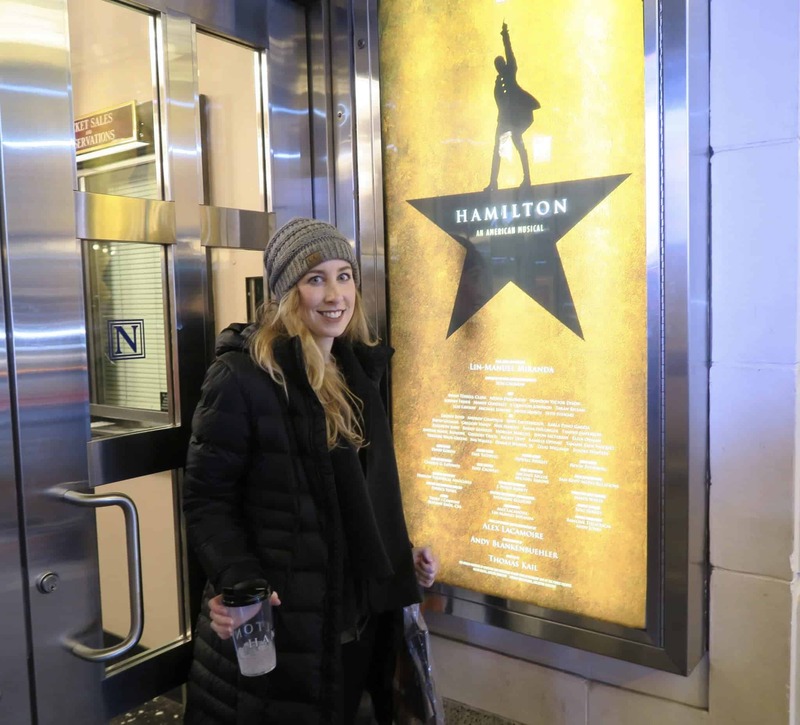 So, when exactly should you be listening to the Hamilton soundtrack? If you want to learn every word to every song, go for it, but start 4-6 months before! If you only want to get a gist of what the show is about and listen to it all the way through a couple times, then start that about 2 months prior. 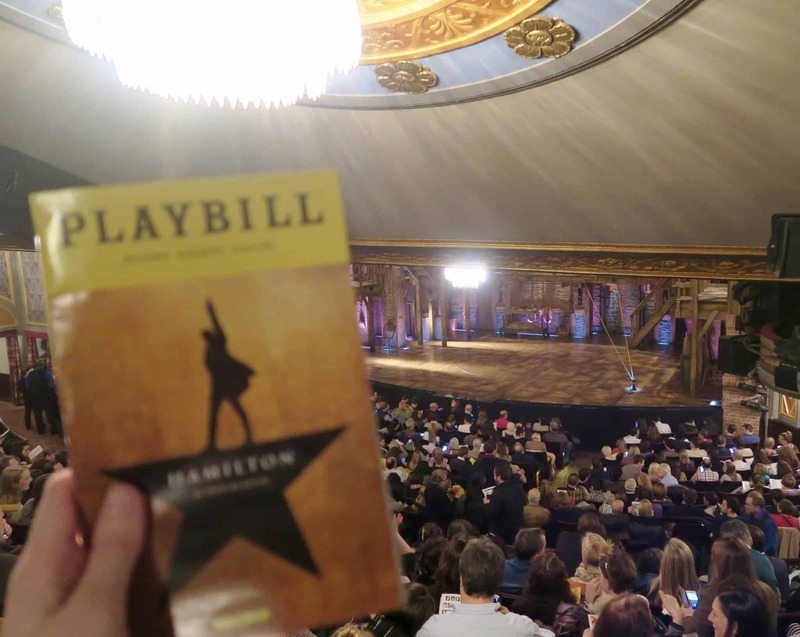 I just so recommend taking a month-long breather from it, so you can be instantly reminded of the amazingness that is Hamilton when you see it live on stage for the first time. The soundtrack is so good, that you just don’t want it to be too ingrained in your brain right before you see the show. You will end up comparing the live version to the soundtrack during the show and that’s just straight up annoying. Plus, you’ll have plenty of time to listen when you spend your Friday and Saturday nights post-show driving around in the car blasting the Hamilton soundtrack instead of going out and socializing for the next 3 months. It may have been six months for me, but who’s counting? What are my favorite songs? This really isn’t super helpful information for you, but I just felt like sharing. Satisfied is my #1 favorite closely followed by Wait For It, Cabinet Battle #1, and Burn. What else should I know about the show? We all learned about the Revolutionary War in American History class, but that doesn’t mean we retained all that information 5, 10, or 45 years later. So, I highly recommend wikipedia-ing some of the major and minor players introduced in the show. I can’t even begin to tell you how beneficial it was learning all of this background information. The more knowledgable you are about each of these historical figures, the more you will relate to their struggles and triumphs. Here is some of the history to know before seeing Hamilton. 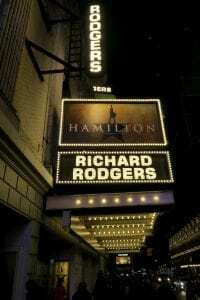 Supporting Players: Angelica Schuyler, Marquis de Lafayette, Jon Laurens, Hercules Mulligan, King George III, James Madison, John Adams (not actually in the show but interesting to know a bit more about him), Peggy Schuyler, Hamilton and Eliza’s children. the story behind Thomas Jefferson’s Virginia residence Montecello. Lin-Manuel Miranda was inspired to write Hamilton because of this book, Alexander Hamilton, by Ron Chernow. Lin read it while on vacation in Mexico and Chernow was actually appointed as the show’s historical advisor. So, if you are curious about what to read before seeing Hamilton, this book would probably your best bet! It also has fabulous reviews. If you are going to see it in New York, overestimate the time it will take you to get to the theater because the traffic is insane. Try and shoot for an arrival a half hour or so before showtime. Also, PRINT YOUR TICKETS OUT AHEAD OF TIME. We almost didn’t get in because they wouldn’t scan off our phones and told us that we needed to go to a Staples across the street to print. Well, it was 6:53 and we were running through Times Square to make it in time, so there was no way that was going to fly. We ended up calling the box office, getting our tickets transferred to Will Call, and literally picked them up one minute before 7:00PM. Remember the days when people used to dress in business attire to fly on an airplane? Me neither. However, I think I can make the generalization that over time, experiences such as going to a Broadway show or attending a religious service have seen a more casually dressed audience. So, would it be necessary to wear a suit or a long gown? Definitely not. However, it’s nice to keep the tradition alive and make a small effort. Dark jeans or pants with a button down shirt, camisole, or sundress/cocktail dress would probably be the most appropriate attire. 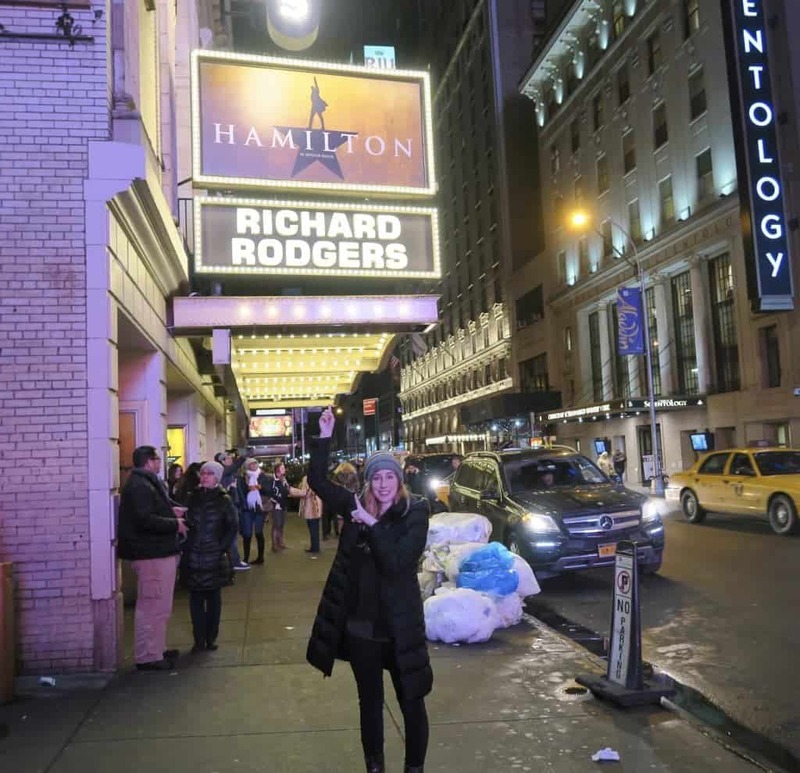 I saw Hamilton in New York in January so whatever I wore was covered up by a down coat, a fleece, 2 sweatshirts, a scarf, etc. You are bound to see a whole range of ensembles, but I’d say it’s best to wear an outfit you would choose for dinner with friends on a Saturday night. P.S. If you are curious about what to wear during winter in New York, be sure to check out my New York winter packing list here. 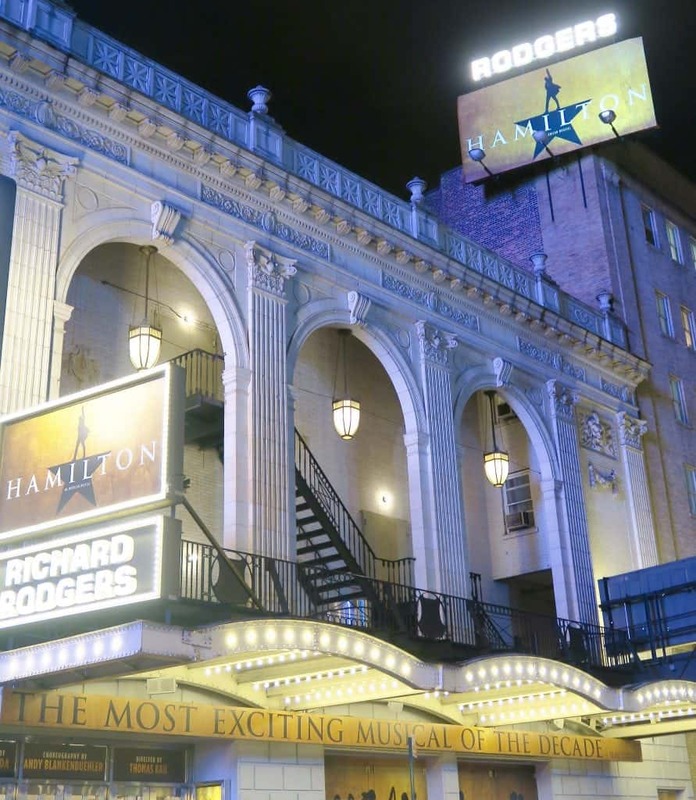 And finally, is Hamilton really as amazing as everyone says it is? Yes, yes it is. But, remember to manage your expectations! I no joke sat next to someone who had the flu, behind someone illegally recording the show, and had my souvenir cup stolen when I was taking pictures outside. BTW, you should totally get a cocktail with a souvenir cup! They are so cool. Sadly, I did let all of that get to me a little bit because I was trying to make this the moment of a lifetime. So as with everything in life, just relax, enjoy and know that even if your experience isn’t perfect, the show is unbelievable and it can and will move you if you let it. Who here reading this has seen Hamilton? Did you learn the music ahead of time or go in without a clue? Any other tips on how to prepare to see Hamilton? And for all of those of you out there, what was your favorite song?! It’s funny…I was not into the rap songs as much until I saw the show and totally changed my tune (yay puns!). The rap songs –esp. Cabinet Battle– were the best part to me hands down. Are you on Pinterest? 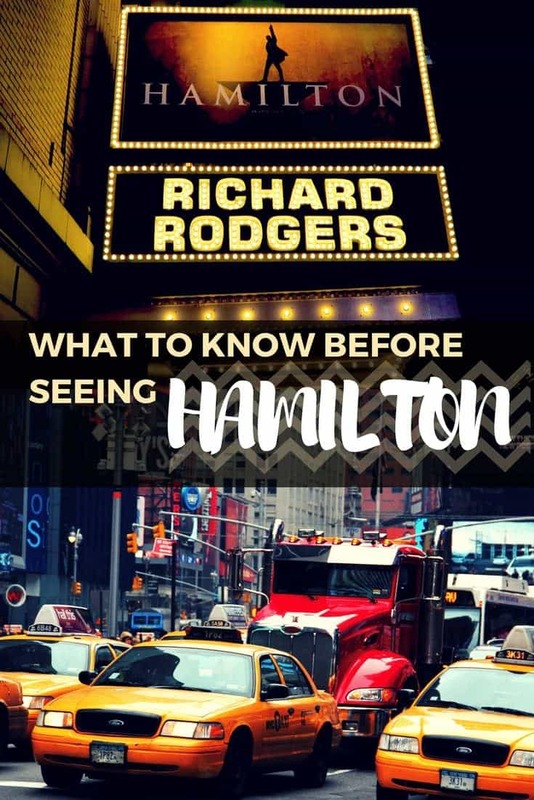 Pin these Hamilton tips for later! 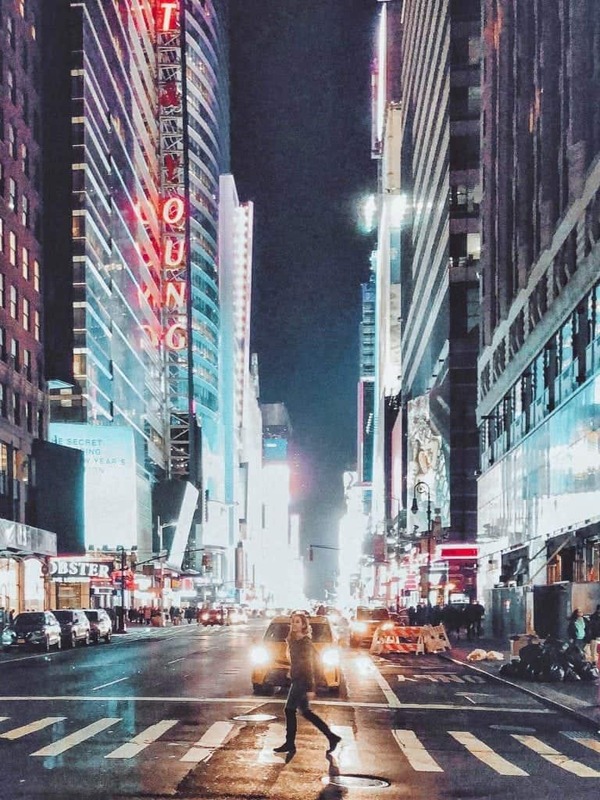 Doing some actual sightseeing on your New York City trip? 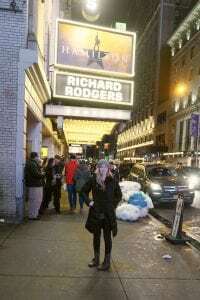 Check out some of my other NYC posts! This post contains affiliate links which means I receive a small commission if you make a purchase using this link. Thank you for the support.